Nicholas Galanin (b. 1979, Tlingit, Unangax̂; Alaska), "We Dreamt Deaf", 2015. 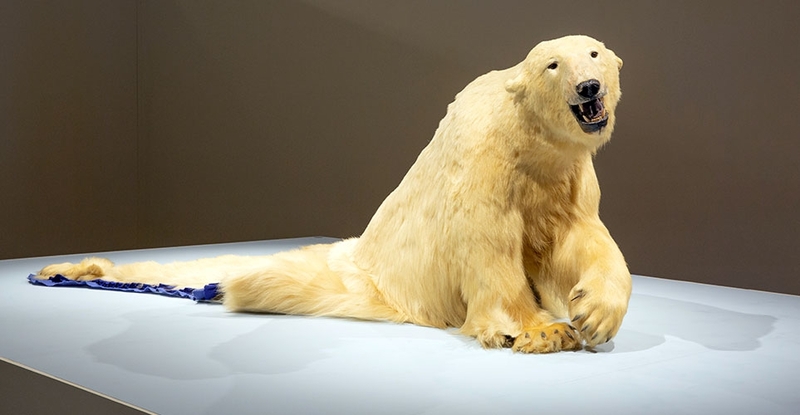 Polar bear taxidermy. Courtesy of the artist. Kapulani Landgraf (b. 1966, Kānaka ‘Ōiwi; Hawaiʻi), " ‘Au‘a," 2019. Digital metal print. On loan from the artist. Marie Watt (b. 1967, Seneca, U.S.), "Companion Species (Speech Bubble)", 2019. Reclaimed wool blankets, embroidery floss, thread. Courtesy of the artist. 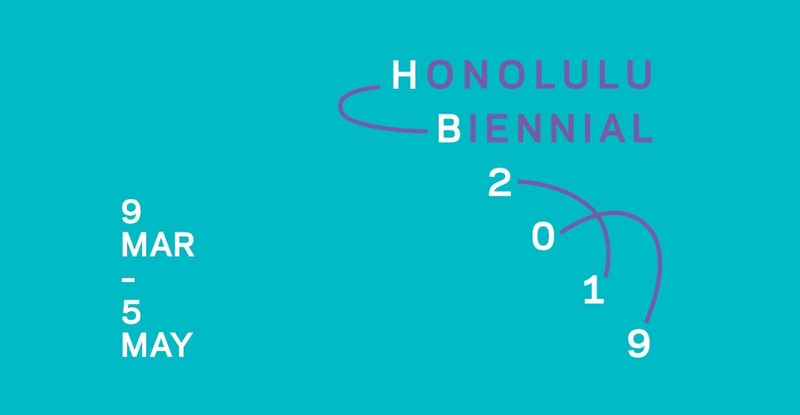 The Honolulu Museum of Art is partnering with the Honolulu Biennial Foundation (HBF) as an institutional venue to present artworks by Kapulani Landgraf, Marie Watt, Nicholas Galanin, and the artist collective Postcommodity in conjunction with Honolulu Biennial 2019, To Make Wrong / Right / Now. Starting on March 9, the installations will span two museum galleries and feature seminal work by each artist surrounding issues pertaining to the Pacific region. 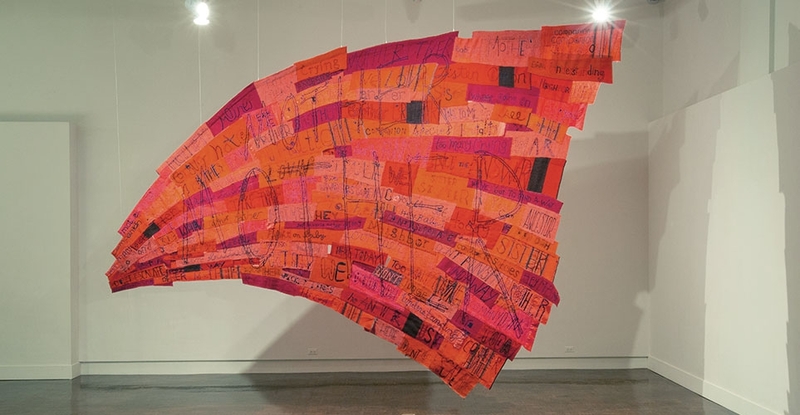 This year's Biennial theme is inspired by a poem from kānaka maoli artist Imaikalani Kalahele called "Manifesto," which explores rectifying colonial injustices through connecting to one's ancestry and transcending time and generations. The curatorial approach by co-curators Scott Lawrimore and Nina Tonga along with assistant curator Joshua Tengan is firmly rooted in the continuum of indigenous knowledge, decolonization, survival in the face of intergenerational trauma, mana wāhine (female empowerment), contesting histories, and a deep reverence for the land, ocean and wahi pana (storied places). 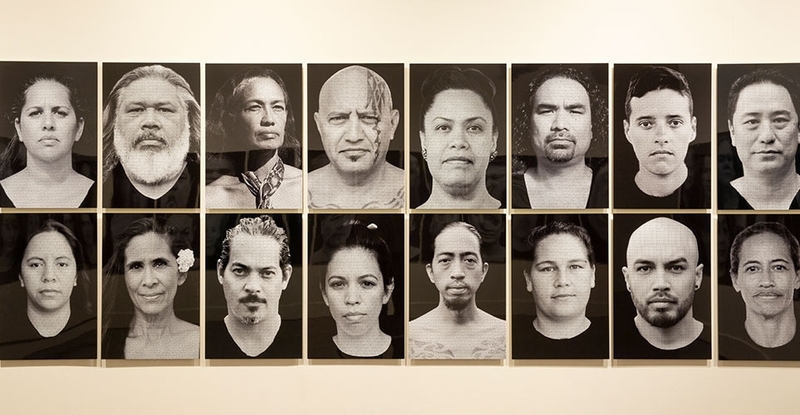 Kapulani Landgraf’s new body of work is in response to a historic speech delivered by scholar and activist Dr. Haunani K. Trask at ‘Iolani Palace in 1993. Landgraf’s installation includes 100 photographic portraits mounted floor-to-ceiling on gallery walls, as the artist explores the potential to affect change through civic engagement. 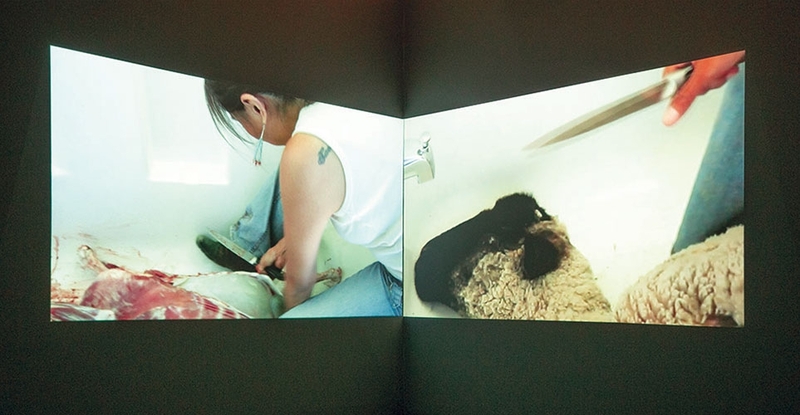 Postcommodity’s multi-channel video installation, Gallup Motel Butchering, considers how the impulse to reproduce sub/urban development models out of sync with place specificities conflicts with land-specific cultural protocols that challenge hegemonic assumptions. Nicholas Galanin grapples with the issue of climate change through his large-scale sculpture, We Dreamt Deaf from the perspective of a Native Alaskan artist whose approach to land-human dynamics closely parallels Hawaiian philosophies. Yet, the artist says We Dreamt Deaf, implicating all of humanity in the discussion of climate change, and the need for us to turn our attention toward the natural world.